Hi friends! Sorry I've been so absent in the blogging world recently. I've had a lot going on and not much time to blog. And by a lot going on, I mean a lot going on. Let me give you the low-down on what's happened in the past month or two. Crossroads Internship - I may (or may not) have mentioned this already, but I've been interning at Crossroads Church for about a month now. I absolutely love it. What a great place to work! I am blessed to work there. I've really had to push myself to do some things - like write a song for Kids' Club. I was ready to give up on writing the music, but I pushed through and came up with something. And I like it. CRUX - I bet none of you knows what CRUX is! And that's okay. CRUX is a discipleship training program that Crossroads has on Thursday nights. Basically, a bunch of 18-35 year olds gather together every week to learn about how to disciple others and make discipleship (training others to be Christ-like) the focus of their life. I love the people here like family, and I've really grown a LOT in faith since joining back in March (ish). People have really pushed me, and I've pushed myself. I'm being discipled by a girl I love and admire, reunited with people from college, and am discipling someone myself. Awesome. See the video below to learn exactly what CRUX is! Nannying - I'm now a nanny twice a week to two boys in Anderson and once a week to two boys in Madeira. I have to say, I really enjoy it. I think I'm going to pursue a full time nannying job in September once my internship has ended, if Crossroads doesn't offer me a job. It's fun and I love it. Plus, it allows me to be crazy creative. We made fossil cookies the other day. How awesome! 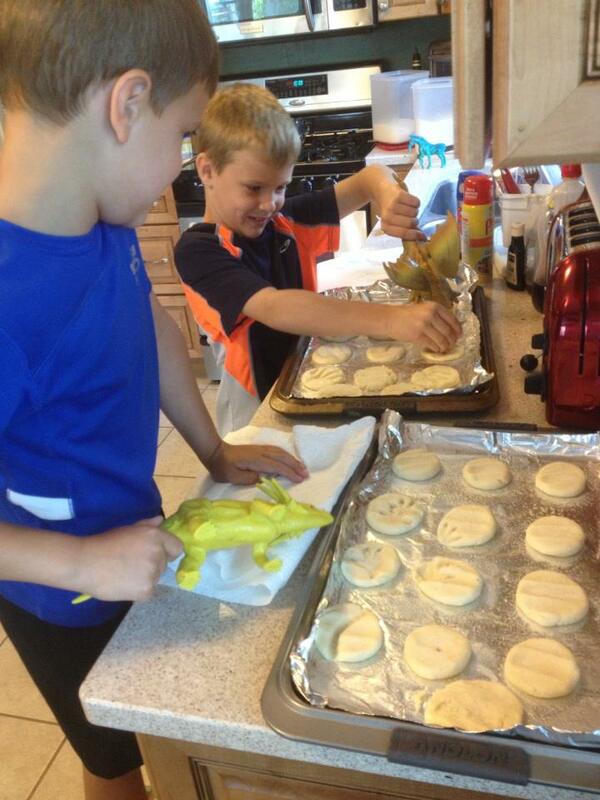 Making fossil cookies with the boys I nanny! Room Redecorating - I'm really into the whole Pinterest/Etsy/hipster/vintage "style" of decor and clothing recently, so I'm slowing creating and redecorating my room to match that style. It's going well, just very, very slowly due the large amount of other things I have going on. Car Troubles - Yeah... my car broke down this morning. The left control arm snapped in half, allowing me the wonderful opportunity to have my car towed. Great. So... there's that. New Orleans Mission Trip - That's right! My missions trip to New Orleans is coming up from July 20-28. I'm stoked! I'm leading a group of volunteers, plus another group of vacation Bible camp volunteers. I'm also in charge of leading all the classroom presentations for the K-2 age group at vacation Bible camp. AHHHH I'm nervous but I cannot wait!!! It's gonna be so great! I miss New Orleans. And FINALLY... what I believe to be some of the most exciting news yet. I'm opening a new blog. Coming soon... Anchored in Hope! A blog about faith in every day life. I've had a lot of God-related stuff I've wanted to blog about recently, and I think this is a great option - especially since I'm a social media intern for a church! I plan on having a staff of guest writers for this blog, so if you're interested, let me know! That was a lot of spewing information. I have a lot of product reviews coming up soon, since I'm super behind in them. Yikes. Sorry to the companies who have sent me product! Love you all. Talk to you soon, I PROMISE! Sweet Rachael! Lots of good stuff happening and I'm so glad! Would like to hear more about your blog! thanks so much Heather! looking forward to sharing!